Ecuador produced the first shock of the World Cup in the tournament’s second match when they beat Poland 2-0 with goals in each half by Carlos Tenorio and Agustin Delgado in Group A yesterday. The Netherlands, a team still without a World Cup title, plays its opener tomorrow against Serbia-Montenegro, a team now without a country. Both teams claim to have gained something that has been sorely lacking in the past — a sense of unity among players. Trinidad & Tobago made a magnificent World Cup finals debut today when they held Sweden to a goalless draw despite playing with 10 men for almost all the second half of their opening Group B game. The beleaguered Togo soccer team was thrown into chaos today after coach Otto Pfister walked out in fury over a pay dispute between the players and the national federation, just four days before its World Cup debut against South Korea. Mexico will hope to kill off Iran’s World Cup hopes at the first hurdle tomorrow as the world number four begin their campaign to mak it past the quarter-finals for the first time. The surprise Group D seeds, who have a point to prove after some unflattering reaction to their exalted status, will have been buoyed by Iran's injury-plagued preparations and indifferent recent form. But Mexico’s preparations were rocked when highly rate goalkeeper Oswaldo Sanchez had to return home following the death of his father. Portugal has a habit of choking in its opening games at major tournaments. So when people say tournament rookie Angola will be easy prey when Portugal plays its first Group D game tomorrow, coach Luiz Felipe Scolari is having none of it. "It's going to be a momentous game," Scolari said yesterday. "We'll show them the respect they deserve." Portugal lost its first game at the 2002 World Cup 3-2 to the United States before exiting in the first phase. Miroslav Klose struck twice on his 28th birthday to lead Germany to a 4-2 win over Costa Rica today, getting the World Cup off to a record-breaking start. Virender Sehwag narrowly missed the rare feat of scoring a hundred before lunch as India made a blazing start in the second Test against the West Indies here today. Sehwag was unbeaten on a glorious 99 filled with 15 fours and two sixes to help India reach 140 for no loss in their first innings after the first session of play on the opening day at the Beausejour stadium. The right-handed opener was actually lucky to survive a run out chance as he scampered for a singles off the last ball before the break in an attempt to reach the three-figure mark. Wasim Jaffer, double centurion in the drawn first Test, was not out on 34 at the other end. The ICC today came up with a ridiculous explanation in defence of the petulant behaviour of Brian Lara during the first cricket Test against India when he snatched the ball from Pakistani umpire Asad Rauf and waggled his finger at him. Cricket South Africa has confirmed India’s tour of the country in November-December as it announced the national team’s full schedule of home and away international fixtures till the World Cup in the West Indies next March. 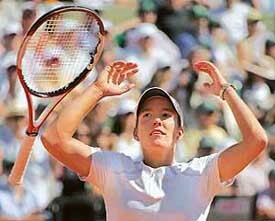 Justine Henin-Hardenne won her third French Open title when she defeated Russian eighth seed Svetlana Kuznetsova 6-4, 6-4 today. An off-colour Viswanathan Anand survived a scare as he scored a come-from-behind victory against Cuban Grandmaster Lazaro Bruzon and advanced to the finals of the 19th Magistral Ciudad de Leon chess tournament here. The 10-day camp for the 18-member Indian squad for the Azlan Shah Hockey tournament in Kuala Lumpur from June 18 to 25 concluded today. Flamboyant England batsman Kevin Pietersen is all set to don a new role after getting engaged to Liberty X singer Jessica Taylor. Mithali Raj was named as captain of the Indian women’s cricket team on Friday, which is set to tour Ireland and England next month. 60 feet long wall painting by soccer lover. Greg Chappell reveals his soccer love. After Tenorio scored in the 24th minute Ecuador, ranked fourth among the South American qualifiers and competing in the finals for the second time, had to show terrific defensive fortitude to hold off the Poles in the second half. Delgado then settled it with 10 minutes remaining to put Ecuador alongside Germany at the top of the group on three points after the hosts beat Costa Rica 4-2 in the tournament’s exciting opening match. 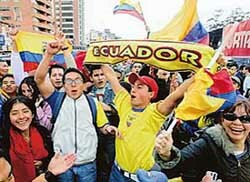 It was only Ecuador’s second competitive win away from the rarefied atmosphere of Quito since the last World Cup but if they repeat it against Costa Rica next week they could reach the second round even if they lose to Germany in their final game. For Poland it was a painful repeat of four years ago when they opened with a 2-0 defeat by hosts South Korea and failed to progress to the last 16. To the huge disappointment of their superb fans, who were full of colour and very noisy at the start, they seem set for another early flight home having failed to score in their opening match for the fifth time in a row. The Netherlands, a team still without a World Cup title, plays its opener tomorrow against Serbia-Montenegro, a team now without a country. Both teams claim to have gained something that has been sorely lacking in the past — a sense of unity among players. Netherlands coach Marco van Basten wants to use that cohesion to make up for a lack of experience in midfield and defence. Serbia-Montenegro, which split up into two countries last month, needs it to cement its defence against a Dutch team that never hides its intentions. It's a prolific Dutch offence led by English Premier League players Ruud van Nistelrooy, Arjen Robben and Robin van Persie against the best defence from Europe's qualifying campaign. "It is a good opponent," said Netherlands coach Marco van Basten, who has produced a team as humble as some of the past were brash and divisive. "It is difficult to beat them because they are well organised in defence and have good strikers." Although he stresses the team is not among the favourites, the whole country is hoping his team will help rid it of a once-complimentary moniker that is starting the rub the wrong way - the best team never to win the World Cup. Serbia-Montenegro, and Yugoslavia that preceded it, has a long history of producing sterling individuals, but they rarely jelled into a tight team. Now, with the country in tatters, the players stick together. "We are optimists because we know how strong we are," Inter Milan's Dejan Stankovic said. They will have to be stronger than the last two encounters against the Dutch. Oranje beat Yugoslavia 2-1 in the second round at the 1998 World Cup in France, and added a 6-1 trouncing at the 2000 European Championship in the Netherlands. The Dutch will be looking for inspirational newcomers to add to the thousands of orange-clad fans in the stands of the sold-out 43,000 Zentral Stadium in former East Germany. Early this week, Van Basten still had five men down with injuries and was only able to send his reserves home yesterday, one day ahead of the cutoff date. There are still major worries about creative midfielder Rafael van der Vaart, the Hamburger SV player who played his last competitive match two months ago. The Caribbean islanders, made up largely of players from the lower divisions of the English league, worked tirelessly to hold off their vastly more experienced opponents in the second game in the group after England had earlier beaten Paraguay 1-0. Trinidad matched the Europeans stride for stride, even after defender Avery John was sent off 35 seconds into the second half. Trinidad came closest to breaking the deadlock when substitute striker Cornell Glenn hit the bar near the hour mark. It was a remarkable performance by a team who qualified for the finals for the first time after beating Bahrain in a playoff while Sweden are notable tournament performers. The gulf in class was seemingly at its most apparent at the centre of Trinidad's defence where beanpole Dennis Lawrence and partner Brent Sancho of lowly English league clubs Wrexham and Gillingham were attempting to shackle Henrik Larsson and Zlatan Ibrahimovic — elite employees of Barcelona and Juventus. However, the difference on paper disappeared on the pitch as the unlikely looking defensive duo survived a testing first 45 minutes with Lawrence proving unbeatable in the air. Sweden did create several reasonable first-half chances as Ibrahimovic fired over a cross just beyond Larsson, Freddie Ljungberg and Larsson put efforts over the bar while Trinidad keeper Shaka Hislop was able to tip over a Christian Wilhelmsson drive. Trinidad rarely threatened, though Carlos Edwards did warm Rami Shaaban's hands with a crisp shot after 33 minutes. The islanders' hopes of holding out for another 45 minutes seemed to disappear 35 seconds after the restart when left back John was sent off for a second booking following a two-footed lunge on Wilhelmsson. The 10 men came close to taking a shock lead after 59 minutes when substitute striker Glen cracked a brilliant shot against the bar from wide right of the box with Shaaban beaten. Togo federation spokesman Messan Attolou said that Pfister had left the hotel in the middle of the night with his assistant trainer, Piet Hamberg. But he said the federation held out hope that Pfister might return. Mexico will hope to kill off Iran’s World Cup hopes at the first hurdle tomorrow as the world number four begin their campaign to mak it past the quarter-finals for the first time. The surprise Group D seeds, who have a point to prove after some unflattering reaction to their exalted status, will have been buoyed by Iran's injury-plagued preparations and indifferent recent form. But Mexico’s preparations were rocked when highly rate goalkeeper Oswaldo Sanchez had to return home following the death of his father. Sanchez caught a flight back to Germany yesterday straight after the funeral, but Mexico coach Ricardo Lavolpe will only decide shortly before the game whether he can play. The opening match is seen as critical to the hopes of both teams in a group which also contains Portugal and Angola. “This is the most important game. We know the game against Portugal will be really hard also so we really need to gain points in this game,” said Iran skipper Ai Daei. Mexico’s own promising build-up saw them lose 2-1 to a second-string Netherlands team. However, a fourth-place finish in last year’s Confederations Cup — including a 1-0 win over Brazil — and a 20-match unbeaten streak have instilled a strong sense of self-belief in Lavolpe’s squad. Portugal has a habit of choking in its opening games at major tournaments. So when people say tournament rookie Angola will be easy prey when Portugal plays its first Group D game tomorrow, coach Luiz Felipe Scolari is having none of it. "It's going to be a momentous game," Scolari said yesterday. "We'll show them the respect they deserve." Portugal lost its first game at the 2002 World Cup 3-2 to the United States before exiting in the first phase. Two years later, it started the European Championship at home with a shock 2-1 defeat to Greece. The Angolans are eager to show their presence at the World Cup is not a fluke. Angola edged Nigeria in African qualifying to reach Germany, and many of its best players are at European clubs. "I know the Angolan players. We've done our homework. We have to match Angola's enthusiasm, step-for-step, tackle-for-tackle," Scolari said. Portugal and its former African colony have met twice before, both times in exhibition matches. In 1989, Portugal thrashed Angola 6-0 and, two years later, won 5-1. "The first game in any competition is the most important game," Scolari said. "If we lose against Angola, the situation will be desperate." World Cup spectators are unlikely to witness a repeat of that last encounter which deteriorated into a bad-tempered game with four Angolans getting sent off. Angola coach Luis Oliveira Goncalves accepted that Portugal is favourite for the game in Cologne. The goal total broke the record for the most in the opening match of a finals tournament, surpassing the five scored in France’s 4-1 triumph over Mexico in the inaugural competition in 1930. Virender Sehwag narrowly missed the rare feat of scoring a hundred before lunch as India made a blazing start in the second Test against the West Indies here today. Sehwag was unbeaten on a glorious 99 filled with 15 fours and two sixes to help India reach 140 for no loss in their first innings after the first session of play on the opening day at the Beausejour stadium. The right-handed opener was actually lucky to survive a run out chance as he scampered for a singles off the last ball before the break in an attempt to reach the three-figure mark. Wasim Jaffer, double centurion in the drawn first Test, was not out on 34 at the other end. Sehwag reached his half-century with a stunning six off Dwayne Brave from only 33 balls, but failed to break the Indian record for fastest hundred, by Mohammad Azharuddin off 74 balls. That Bravo cost 21 runs as Sehwag collected another six and two fours. So far, the Delhi batsman had faced 75 balls in 120 minutes. 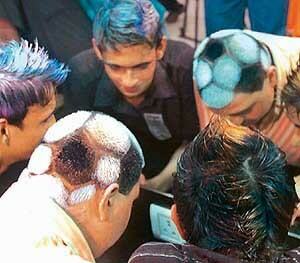 There was both exhilaration and disappointment for the Delhi dasher as he had an opportunity to break a host of records. 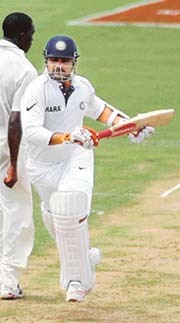 Sehwag took the drinks break at 65 runs from 38 balls and looked in course to push Viv Richards' fastest century record of 56 ball off the record books. He missed it but looked almost certain to overtake Kapil Dev and Mohammed Azharuddin as the two Indian who took the least 74 number of balls to reach a Test century. Kapil Dev did his act against Sri Lanka in 1986-87 while Azhar's blitzkrieg erupted against South Africa in Kolkata in 1996-97. That being missed also, Sehwag looked as good as having joined an elite list of Victor Trumper, Charles McCartney, Donald Bradman and Majid Khan as the fifth batsmen who has hit a century in the opening session of a Test match. He needed seven from the final over before the break from Corey Collymore. He upper-cut a four, took a single and finally needed just two runs to reach the landmark off the final delivery. Sehwag drove it to mid-off, took a quick single and kept going past the non-striker's end when a quick look back would have given him another run as the ball had gone past the stumps for an overthrow. “Lara showed a little frustration but it was borne out of circumstances,” ICC’s General Manager-Cricket Dave Richardson said. “Lara is a renowned player, a famed cricketer. He got frustrated (after) the umpire forced the players to make a decision. He did get a little frustrated, snatching the ball from the umpire, but he certainly did not show dissent,” he told NDTV. Richardson also sought to justify the fine imposed on Virender Sehwag for prematurely celebrating a dismissal. “The Sehwag incident was unfortunate. The ICC wants to cut down on excessive appealing. We want to prevent players, tell them not to put too much pressure on umpires. In Sehwag’s incident, it was a case of not appealing. He slipped up (on that account).” On the controversial Dhoni dismissal, he said he had never come across such an incident, be it in his playing days or as an administrator. CSA CEO Geral Majola, announcing the schedule, said South Africa’s 2006-07 season would begin next month. “Cricket fans are in for a bumper season that includes the tour of Sri Lanka in July, the ICC Champions Trophy in India in October, tours by India and Pakistan in November and January respectively, and ending with the World Cup in the West Indies in March,” Majola said in a statement yesterday. India will play five one-day internationals and three Test matches in South Africa after they visit the sub-continent for the ICC Champions Trophy in October. CSA’s General Manager for Cricket Affairs, Brian Basson, who announced the itineraries, said: “We are delighted that after months of negotiations, confirmation of the outgoing tour of Sri Lanka and the incoming tours of India and Pakistan have been finalised. “The reasons for the protracted delay can be attributed to full member countries having displayed reluctance in entering into any fixed tour arrangements prior to final confirmation of the ICC’s Future Tours Programme,” Basson said. The Belgian fifth seed, who also won the tournament in 2003 and 2005, joined Margaret Court, Chris Evert, Steffi Graf and Monica Seles as the only women to have won back-to-back titles at the claycourt Grand Slam in the professional era. She also became the first player since Arantxa Sanchez-Vicario in 1994 to win the crown without dropping a set. Henin-Hardenne began swiftly by breaking Kuznetsova in the first game with a forehand winner. She tightened her grip on the match further when she opened up a 4-1 lead courtesy of a double-fault from the 2004 U.S. Open champion. Kuznetsova closed the gap when she too benefited from a Henin-Hardenne double-fault in the sixth game. But the Russian was unable to get back on level terms and Henin-Hardenne pumped her fists after securing the set when Kuznetsova netted a forehand. Kuznetsova rose to the challenge in the second, breaking in the second game only for Henin-Hardenne to break back immediately. The Belgian gained the decisive break in the seventh with a smash and ended Kuznetsova’s challenge with a service winner on her second match point after 96 minutes. Anand, who is going through a lean patch, yesterday came through some anxious moments before winning the blitz tiebreak game, eighth of the match, for a 4.4-3.5 victory. In the final tomorrow, Anand will meet the winner of the match between world champion Veselin Topalov of Bulgaria and Francisco Vallejo Pons of Spain. It turned out to be a taxing outing for Anand against Lazaro in the clash of former junior world champions. Earlier in the Chess Olympiad too, these two had crossed swords and the result there was a stalemate that continued here for the first four rapid games. It was a surprising result as Anand is highly regarded as the best rapid chess player on the planet. The matches here are played with 20 minutes to each player with a 10 second increment after every move is played. After the first four rapid games were drawn, the match moved to tiebreak blitz games where Lazaro drew the first blood winning the first game. Anand was under pressure in the next game as he needed a win to stay in the match. Talking to reporters, captain Dilip Tirkey said, “We have a balanced side and the training, despite hot conditions here, was enjoyable and the members of my team are in good nick.I am worried about poor finishes inside the circle but our retackling abilities have improved tremendously. “During the last few tournaments, we were mainly concentrating on total attacking and lacked defence. But the new method of coaching has helped us eradicate this weakness,” he said.